Aqua Samui is located on Koh Samui (island) in the Southern Thai province of Surat Thani. A tropical island of great natural beauty and variety, Koh Samui has an abundance of natural resources, white sandy beaches, coral reefs and coconut trees. Samui is a world class destination that attracts over 1.5 million tourists per year. Stunning white sandy beaches border the eastern shores of the island. The most popular beaches, Chaweng and Lamai, boast a curious mix of luxury hotels and guesthouses, and a hopping nightlife. 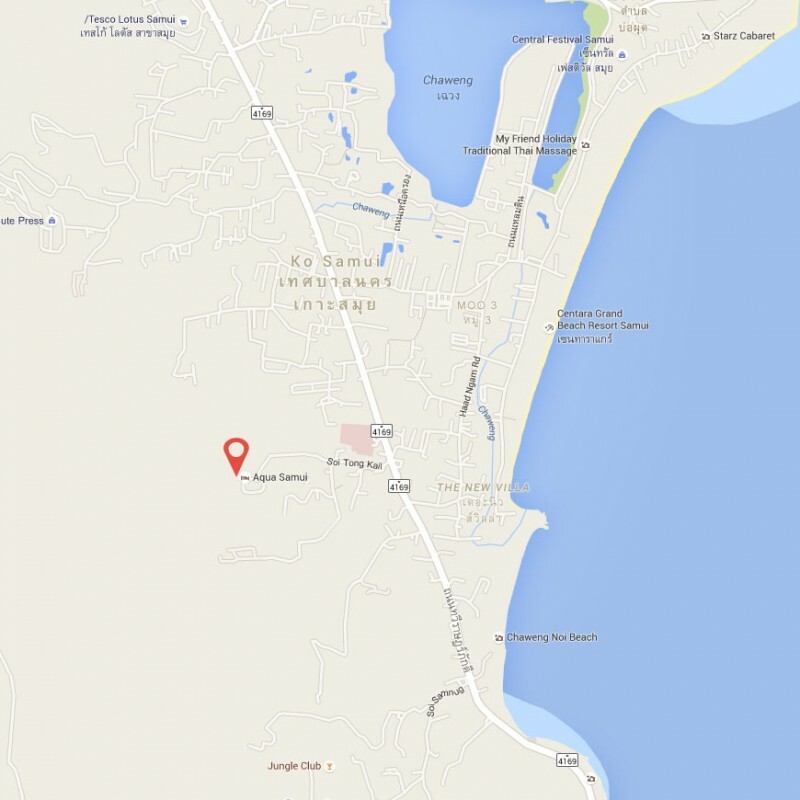 Nearby are the tranquil, romantic villages of Mae Nam, Bophut, Bang and Choeng Mon. Koh Samui is considered one of the safest diving and snorkeling destinations in the world, so it’s perfect for first-timers. And it’s possible to dive virtually all year round. For world-class divers, there are two exceptional dive spots: Ang Thong National Marine Park or Ko Tao. The Aqua Samui location is amongst beautiful lush hills, and only a few moments by car to the famous shopping strip, international restaurants, beach of central Chaweng. Samui international airport is less than 10 minutes away and 2 major hospitals are less than a 2 km drive, while the two top international schools and major shopping and top retail centers ,Tesco Lotus and Big C, are just minutes away.